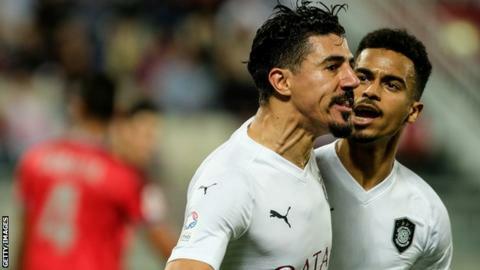 Algeria's Baghdad Bounedjah grabbed a hat-trick for his club Al Sadd to help them clinch the top-flight Qatari Stars League with a match to spare. His sixth treble in the 21st league game of the season came in a 7-2 win over Al Ahli on Thursday and took his total to 39 for the season. The victory gave Al Sadd an unassailable seven point lead over Moroccan Medhi Benatia's Al Duhail. Another Moroccan at Al Duhail, Youssef Al Arabi, is the second highest scorer with 25 goals. Belgium-born Rachid Tiberkanine, who has two caps for the Atlas Lions, is fourth on the list with his 13 goals for Al Sailiya.